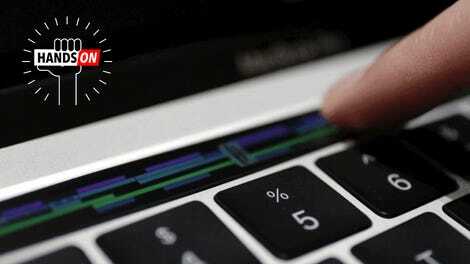 Logging into your computer with your fingerprint isn’t new, but it still makes me a little giddy when the MacBook Pro’s Touch Bar appears, glowing brighter than the backlit keyboard. I follow the Touch Bar’s direction, and like magic I’m into laptop. It’s instantaneous. The fingerprint reader is one of the smallest improvements to Apple’s all new MacBook Pro with Touch Bar, but it might just be my favorite. There, hidden beneath the MacBook Pro’s flashiest gimmick, is something incredibly functional and natural to use. I’ve spent a little over a week with both the base 13-inch model ($1799) and the base 15-inch model ($2399) of the new MacBook Pro with Touch Bar and, already, switching back to a MacBook without the Touch Bar feels odd. (There’s a cheaper $1499 model without a Touch Bar as well.) Sure, the illuminated strip at the top of the keyboard is unmistakably a stunt designed to compete against big engineering feats like the Surface Book’s magical reversing hinge, not mention the allure of powerful, inexpensive Apple knock-offs like the Razer Blade Stealth, but the Touch Bar is also cool as hell. Whether it’s actually useful is another question entirely. Is this a meaningful upgrade or flashy garbage designed to justify the MacBook Pro’s very expensive price tag? The 2170 x 60 OLED display sits above the keyboard where the function keys used to sit. Depending on what app you’re using and what is happening inside the app will determine what options you see. The standard Touch Bar screen on the desktop shows a mostly blank canvas, with the exception of shortcuts to the volume controls and Siri. Using a “Customize Touch Bar” option, you can choose what shortcuts you want to see on the Bar at all times. Tapping on the expand arrow will open up the full set of standard Mac keys, including shortcuts for Expose, Launch Pad, brightness, and music playback controls. This is the Touch Bar when you open up your Mac. The icons to the right can be customized. The Touch Bar really comes alive when you use it with an app programmed specifically to work with it. Right now, that includes most Apple apps (Mail, Notes, Photos, iMovie, Garage Band, and Final Cut Pro X) and a smattering of third-party apps such as Pixelmator, Microsoft Office, Coda, Sketch (soon), 1Password, and OmniGraffle. More app support is coming, with Photoshop projected to get support by the end of the year. As with the area at the top of the iOS touch keyboard, the Touch Bar suggests words as you type, or gives you quick access to font and formatting options. If you’re typing in text, these are the screens you’ll see in most apps that support the core text input. Having instant-access to emoji is certainly amusing, but I don’t think it’s any faster to bold a line of text by tapping the “B” on the Touch Bar than it is to just press CMD-B on the keyboard. In Mail, similarly, Touch Bar offers you a number of options for common actions that weren’t that hard to begin with. I can quickly file all my November emails from my editor or choose whether I want to reply or reply all to my coworker’s latest GIF deluge. But I don’t know if this is any faster than just using built-in keyboard shortcuts. The Touch Bar options in mail. You have one tap access to moving to a specific folder, flagging a message or archiving,. This is what appears when you are composing a message in mail. Note the easy access to the send button. There are some apps, such as Final Cut Pro X, where I do think the experience is more natural. Scrubbing through video on the timeline with the Touch Bar is an action that makes a ton of sense and is a better experience than trying to scroll through with a mouse or by using the trackpad. And for apps like Pixelmator (and eventually Photoshop), where keyboard shortcuts can be difficult to remember when you aren’t in the app 24/7, the Touch Bar makes your life easier. This is what appears when you tap on the brush icon. IT offers up easy access to the lasso, pointer, crop tool and more. This is much easier than me trying to remember them all. 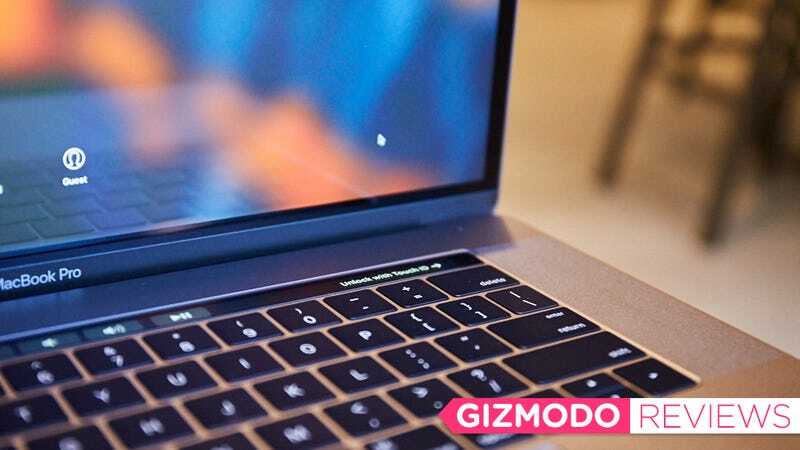 And for now, that’s the problem with the Touch Bar: It’s not especially useful for either regular people or for the mythical “pros” the new MacBook line is supposedly designed for. The Touch Bar is most compelling for professionals, but these people live and die by their memorized shortcuts, so for now, the Bar isn’t not going to going to make a big impact. I don’t need Touch Bar in Photoshop because I’ve already memorized how to switch between the Heal and Lasso brushes. Yet the lack of usability for Apple’s former core market could change once third-party developers figure out how to create really customizable tooltips for the Touch Bar. For now, the bigger win is Touch ID. I’m shocked by just how much I love having Touch ID on the Mac. Rather than having to enter in my password every time I need to perform a system function, I can just tap my finger on the sensor that doubles as the power button. It’s incredibly fast and seamless, and it works with Apple Pay too, which means, when you’re browsing on Safari, you can just press your finger to the button instead of entering your credit card number on supported sites. That’s one big honking trackpad. Beyond the Touch Bar and two extra Thunderbolt 3 ports on the side, the 13-inch model is a dead-ringer for the non-Touch Bar model. The 15-inch model is smaller and thinner than its predecessor and adds a much larger Force Touch trackpad. Performance on both models is what you would expect when you’re spending a minimum of $1800 for a laptop. In GeekBench 4, our Photoshop test, and with WebXRPT, both models delivered the highest marks on any laptop we’ve tested in the last few months, including the new, comparable, Razer Blade Stealth which is over $500 cheaper, and the upgraded Surface Book, which is just as costly but incorporates a full touchscreen instead of a single Touch Bar. Third-party support for the Touch Bar is sparse but growing. Expect apps focused on design and coding to adopt first. My favorite Touch Bar app so far is 1Password, largely because it uses the Touch Bar and Touch ID. Touch ID on the Mac is awesome. To use your old peripherals, you’ll be in dongle hell for the short term, but the 4 Thunderbolt 3 ports at least give lots of connectivity options for the future. I really hope Google chooses to support the Touch Bar. It could be very useful, especially with extensions. Performance is top notch across all of our benchmarks but if you’re getting the 13-inch, consider spending the extra $200 on 16GB of RAM now, since you cannot upgrade later. I’m still bummed about the lack of a rose gold color option.